For their final warm-up match of the new season, Lyon take on Grekk side PAOK Salonika, who they beat 1-0 (Frau) in a friendly back in July 2004. In the 2005/06 season, the side coached by Romanian Ilie Dumitrescu (63 caps, 22 goals; former player of Steaua, Tottenham, FC Seville, West Ham…) finished sixth in the Greek league behind Olympiakos. The black and whites (46points; 13 wins, 7 draws and 10 defeats; 44 goals for and 31 against) finished 24 points from the champions! The striker Salpigidis was crowned Golden Boot with 17 goals. The same player also scored three goals in the UEFA Cup. 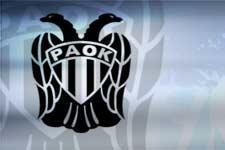 The sixth place would normally sent PAOK into the UEFA Cup, but due to financial problems, PAOK has been denied European competition. During the 2005/06, the side was eliminated in the group phase of the UEFA Cup despite having beaten Rennes 5-1. Greek champion in ‘76 and ‘85; Cup winner in ‘72, ‘74, ‘01 and ‘03, the northern club began their pre-season on July 3. Their opening match of the Greek first division will be in mid-August away to AEK Athens. And finally, Lyon fans blessed with a great memory would remember that in the 1973-74 season in the Cup Winners Cup, last 16, PAOK eliminated OL – 3-3 at the Stade Gerland (Lacombe, Di Nallo, Ravier) and 4-0 in the return leg.